Rep. Robyn Porter watches the board as the votes for HB 5386 are tallied. The House of Representatives took a step toward closing the gender wage gap and ensuring women earn equal pay for equal work by passing House Bill 5386. We also passed a resolution that moves us forward toward amending the state’s constitution to allow a system of early voting during elections. This will help many people, for example those who have to work two jobs while caring for their families, with the ability to vote early and increase participation in elections. 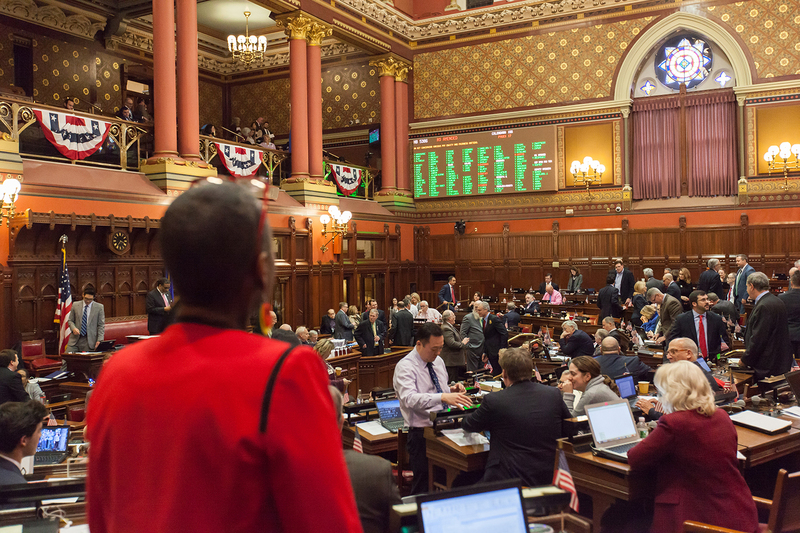 The legislation, which was supported by the business community and advocates alike, would prohibit employers from asking prospective employees about their previous wages, now heads to the state Senate for further consideration. The gender wage gap affects families at all income levels and all professions. In Connecticut, women working full-time earn 83-cents for every dollar paid to men. Each year, Connecticut women lose a combined $5.5 billion due to the wage gap. We are proud of the bipartisan adoption of a resolution that would amend the state’s constitution to allow a system of early voting during elections. If adopted, Connecticut will join many states across the country to have early voting as an option for our residents. This measure will facilitate voting for those that have difficulty getting the polls during one-day polling hours. House Joint Resolution 28, Resolution Proposing a State Constitutional Amendment to Permit Early Voting, now goes to the Senate. If approved, the resolution must be adopted again next year by both chambers of the General Assembly. It would then be placed on the ballot for the 2020 general election. If a majority of voters approve, early voting then would become part of the state constitution and implemented.